In August of 2015, the Galileo’s World exhibit opened at the University of Oklahoma. The exhibit highlights the University’s outstanding collection of rare scientific texts, including every book Galileo ever published (and two that include writing in his own hand), as well as the works of many of his predecessors, contemporaries and followers. The exhibit seeks to examine sixteenth- and seventeenth-century culture more broadly and to explore connections between the music, art, literature and science of the period. Galileo’s signature on OU History of Science Collection’s copy of Sidereus Nuncius (1610). 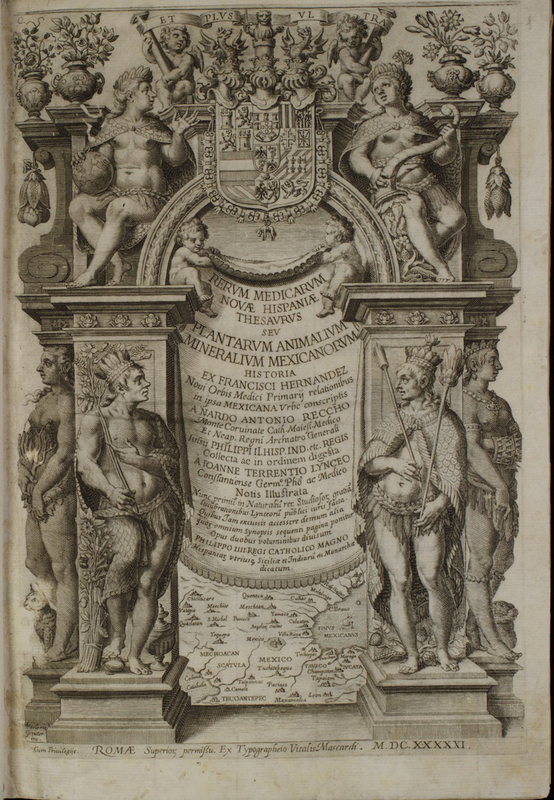 Title page of Francisco Hernández, Nova plantarum, animalium et mineralium Mexicanorum historia (Rome, 1651). Image Courtesy of the OU History of Science Collections. The guiding question of the exhibit is: How did the natural knowledge of Native Americans shape European science in the age of Galileo? A blog post on the exhibit by the curators claims: “Through [Hernandez’s] work, Native American knowledge of plants and animals became part of mainstream European biology.” The visitor is presented with a spectacular array of books on natural history (and other subjects) written by European naturalists and published in various European languages. The exhibit amply demonstrates that Europeans were fascinated by the strange flora and fauna they saw in the Americas, and that they sought to describe the plants, animals, minerals and peoples they encountered. But the guiding question is never actually addressed. That is, we learn much about what Europeans thought of the “New World,” but nothing about what the indigenous peoples of Mexico thought about the plants and animals of the region. And other than the vague statement that Hernández “worked closely with Aztec artists and physicians in central Mexico,” we learn nothing about how and what Europeans learned (or didn’t learn) from native inhabitants. The statement itself is deeply problematic as “worked closely with” suggests respectful and harmonious scientific collaboration. We need to recognize that Hernández came to Mexico in the wake of an extremely violent conflict and a massive disruption of the existing social structures in the Americas. He was part of a occupying force, not a sympathetic or even a neutral observer of native inhabitants. His mandate was to learn about the flora and fauna of the Americas so that the King of Spain would be in a better position to exploit them. One graphic from the exhibit powerfully illustrates this erasure of indigenous knowledge and indigenous peoples. On one wall the visitor is presented with a “tree of knowledge” showing the progress of biological knowledge from its “primitive roots” to its full flowering into sophisticated (European) scientific knowledge. Take a closer look at the “roots” of this tree. 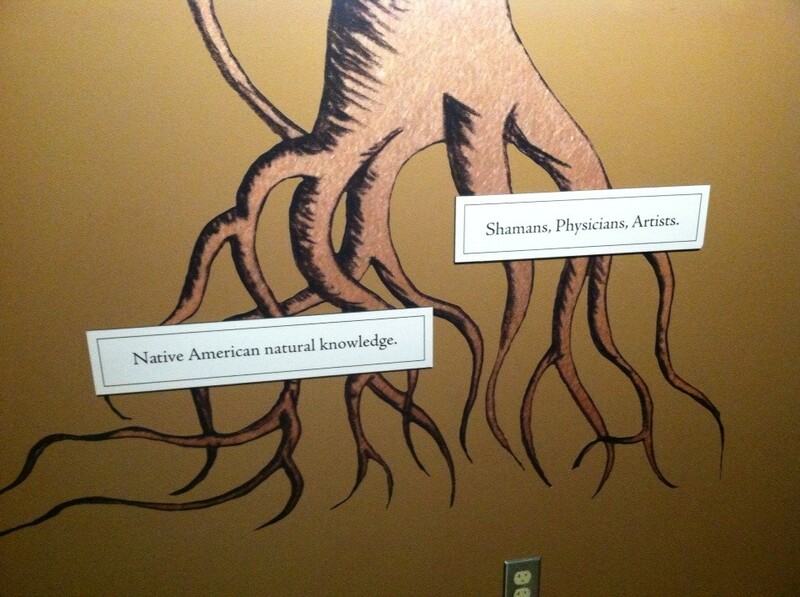 “Native American natural knowledge” is vaguely linked with shamans, healers and artists. But we learn nothing of any of these native men and women from the exhibit. They are relegated to a generalized “pre-scientific” past from which Europeans drew to create modern science. The placard for Hernàndez’s book Nova plantarum, animalium et mineralium Mexicanorum historia asserts: “In Galileo’s time, European progress in the life sciences depended on the natural knowledge of central Mexico’s native inhabitants.” A clear separation is drawn between “natural knowledge” which is primitive, mixed up with religion, and generally unworthy of serious discussion, and the “life sciences,” which are systematic, rational and progressive. So the curators take a dim view of indigenous knowledge, but what about Hernández? One piece of evidence may have been misunderstood as suggesting that Hernández “worked closely with Aztec artists and physicians in central Mexico.” He gives the names of plants and animals in Nahuatl as well as Latin. Nahuatl was (and is) a language spoken (and written) by various peoples in central Mexico, including the Aztecs. But today there are over 60 indigenous languages spoken in Mexico. Even if Hernández attained some fluency in Nahuatl (and it is by no means clear that he did), that would not have enabled him to communicate with all indigenous groups in the region he had been sent to study. He must certainly have worked with intermediaries. More importantly, Hernández’s use of Nahuatl names reflects the contemporary European belief that there is a natural connection between a name and a thing; the name revealed essential properties of the thing to which it referred. This belief, more than any “respect” for indigenous culture and knowledge, is a more likely explanation for Hernández’s decision to use Nahuatl words. His use of Nahuatl, alone, shows neither a respect for natives, nor scientific collaboration. What can we actually know about indigenous knowledge and how Hernandez used it in his book? While I can’t provide a full answer for this question, I’d like to propose an interesting test case. I’m going to take a more in depth look at a Mexican plant and an animal: the Opuntia, a type of cactus also known as the Indian fig, or prickly pear, or nopal; and the cochineal insect, a parasite that lives on the opuntia. The cochineal insect was (and is) used to produce a very valuable dye, so Hernández ought to have been strongly motivated to gather accurate information about it. And in this case we can reconstruct in some detail what the indigenous people of Mexico knew about opuntia and cochineal, and contrast what Hernández and other early modern European scholars wrote about them. Was Hernández actually equipped to grasp what the indigenous peoples knew about cochineal? And were they inclined to share information with him about the production of a very valuable commodity, one that gave them a measure of power over their Spanish overlords and a connection to their pre-Conquest past? The answer to both of these questions is almost certainly no. I think this example seriously calls into question the notion that Hernández and Native Americans freely exchanged scientific information about plants and animals. Dactylopius coccus (cochineal) growing in Barlovento, La Palma, Canary Islands. Photo by Frank Vincentz (14. March 2008). Wikimedia Commons. The native peoples of Mexico used the cochineal insect to produce both dyes and medicines. The cochineal insect lives on the opuntia cactus. Females attach themselves permanently to the opuntia and spend their whole lives sucking out the juice of the cactus and laying eggs. Males fly around and fertilize the eggs. They are fewer in number than the females and live for half as long. 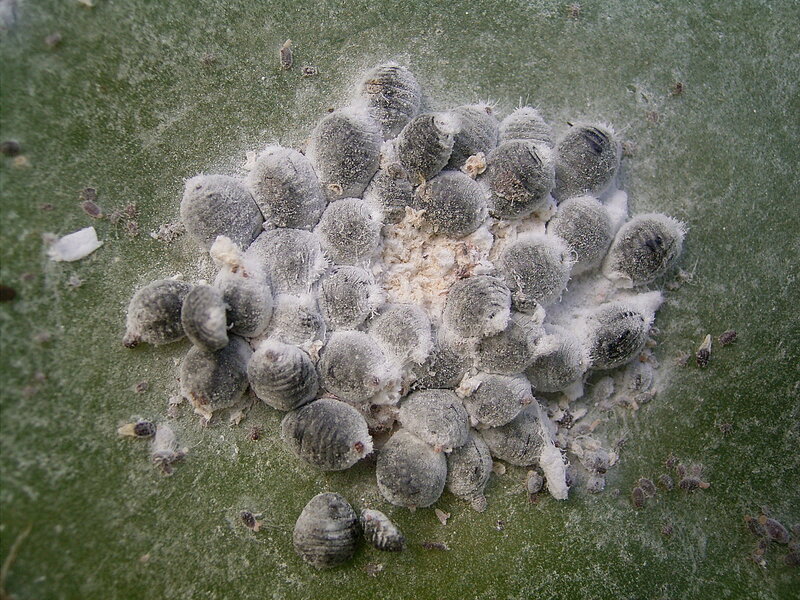 The female cochineal, because she can’t move, is vulnerable to predators. As a means of self-defense, cochineal insects have evolved to produce carminic acid, which makes them unpalatable to many potential predators. Carminic acid can be used as a red dye, and it produces an exceptionally vivid and long-lasting color. But cochineal insects were not simply wild animals that the indigenous people exploited. Rather, through selective breeding they had created a new species of domesticated cochineal that was larger than wild cochineal and had a higher concentration of carminic acid. This domesticated cochineal was considerably more delicate and vulnerable to changes in temperature than its wild relative. The opuntia on which it lived was also susceptible to cold and damp and would easily rot. The cochineal and the opuntia had to be carefully tended to keep them alive and productive. It was a labor-intensive form of farming, but well worth it because cochineal was a highly valuable commodity. While I have used certain modern and anachronistic terms here, like “evolved” and “carminic acid,” it is clear that indigenous people deliberately manipulated the insect and the cactus to maximize production of a desired commodity. Now let’s turn to what Europeans knew (or thought they knew) about cochineal and opuntia. 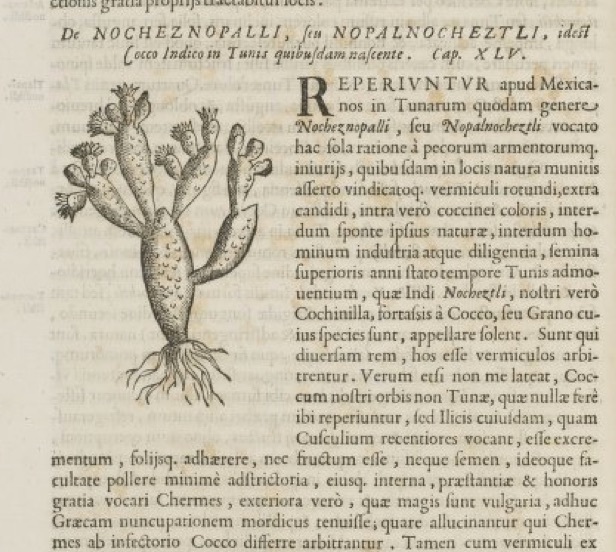 In his Nova plantarum, animalium et mineralium Mexicanorum historia (Rome, 1651), Hernández describes “a certain species of cactus called Nocheznopalli, or Nopalnocheztli” (quodam genere Nocheznopalli, seu Nopalnocheztli). “Nocheznopalli, or Nopalnocheztli” (Opuntia) from Hernández, Nova plantarum . . .
… round worms, white on the outside, within, however, of scarlet color, [which grow] sometimes naturally of their own accord, sometimes by the industry and diligence of men, who move the seeds from the previous year at a set time. [The Indians call these worms] Nocheztli, our men, however, are wont to call them cochinilla, perhaps from cocco [scarlet], or grain, whose appearance they have. … vermiculi rotundi, extra candidi, intra vero coccinei coloris, interdum sponte ipsius naturae, interdum hominum industria atque diligentia, semina superioris anni stato tempore Tunis admoventium, quae Indi Nocheztli, nostri vero Cochinilla, fortassis a Cocco, seu Grano cuius species sunt, appellare solent. We might note here that in Nahuatl, the name of the plant (Nopalnocheztli) contains the name of the insects (Nocheztli). These cactuses are also called “nopals,” which is still their name in Spanish. This suggests that the two were seen as a unit. Excrements are generated on many plants, which are then transmuted into various species of insects. Thus it is not only coccus that is born on a scarlet oak , but also flies grow inside the gall-nut on the oak, [and] one is able to observe the same thing in the vesicles of the elm, and on the terebinth [turpentine tree] and many other plants. Excrementa pluribus adnascuntur plantis, quae deinde in varias insectorum species transmutantur. sic non tantum Coccus in Ilice nascitur, sed etiam quaevis Galla in Quercubus intra se Muscam gignit. idem observare licet in vesiculis Ulmi. Terebinthi aliisque plantis compluribus. It is clear from this description that Hernández had only a limited understanding of the opuntia and the cochineal. He knew that cochineal was used as a dye and a medicine. But he was only vaguely aware of the difference between wild and domesticated cochineal, and he believed the cochineal were spontaneously generated on the opuntia, rather than placed there by their cultivators. He used a European concept – spontaneous generation – in an attempt to make sense of what he had seen or heard about the opuntia and the cochineal. The notion that certain creatures, usually insects, toads and frogs, could spontaneously generate out of rotting material was widely accepted by sixteenth-century Europeans. John Gerard, The Herball (London, 1597). Courtesy of the OU History of Science Collections. 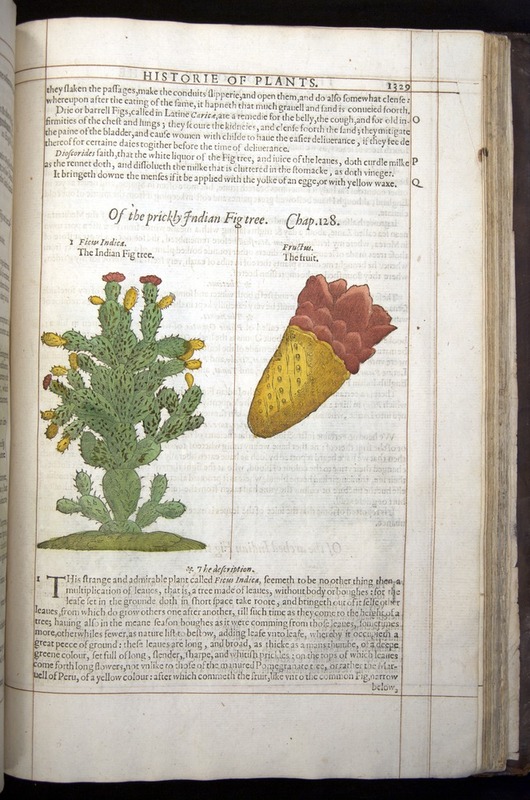 The botanists Carolus Clusius (1526–1609) (whose work is displayed in the exhibit) and Matthaeus Lobelius (1538–1616) included descriptions of the opuntia in their works on plants. The information about the opuntia in these texts is almost wholly divorced from their native context. Aside from the brief mention that Indians use the plant on wounds because of its astringent properties, all sources cited are European, and all descriptions refer to opuntia cultivated in European gardens. Neither author even mentions cochineal, which, as we have seen, was inextricably linked with the opuntia in indigenous understandings of the plant. 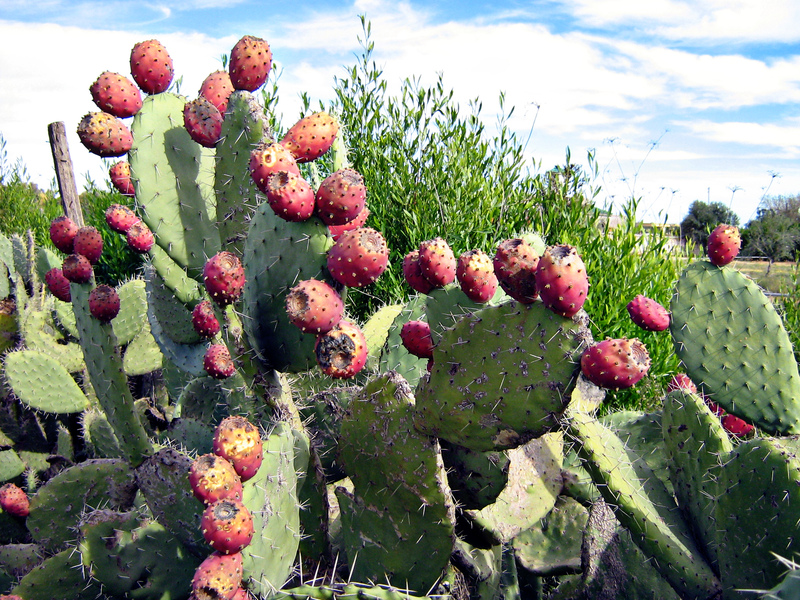 And they transfer the healing properties of the cochineal (its use as an astringent on wounds) to the opuntia. Another English naturalist, Thomas Moffet (1553–1604), included the cochineal in his Theater of Insects. Like Hernandez and Gerard, he thought it generated spontaneously from the opuntia. Other European naturalists believed that the dye and medicine called cochineal were derived from the fruit of the opuntia itself, and still others believed the cochineal was a seed or berry of the opuntia. In the late 17th century the two most outstanding microscopists of the period, Anton van Leeuwenhook and Jan Swammerdam examined cochineal under a microscope and eventually concluded that it was an insect, not a seed. But because they were looking at dried insects imported from Mexico, their findings were not considered certain. Even in the 18th century when Europeans finally came to understand that cochineal was an insect and that it was not spontaneously generated but rather carefully cultivated, all their attempts to breed and raise cochineal in Europe or other colonies often failed. Extract a tincture from 2 drachms of opium, 1 drachm of crocus, 1 drachm of cochineal, 1 drachm of Spanish contrayerva, 1 drachm of Virginia snakeroot, using spirit of elderberries. It is an anodyne elixir by which sleep and sweat are induced at the same time. The dose is from 20 to 30 drops. If the same tincture is extracted using spirit of sal armoniac, the same dose produces the same effect in the fevered after which the disease comes to its crisis and begins to weaken. Such experiments on the medicinal properties of cochineal were conducted on dried and prepared cochineal imported from Mexico, not on the living insect. And they were based on European understandings of physiology (primarily the theory of the four humors) and European disease categories. I raised the question above of whether Hernandez and his contemporaries had the conceptual tools to grasp what the indigenous people knew about cochineal. His understanding of cochineal, and those of other early modern Europeans, takes place wholly within received Western categories. He failed to learn what we would today consider the most basic facts about the opuntia and cochineal from native informants. In fact “Western” scientists lacked the conceptual tools to understand the native knowledge of opuntia and conchineal until the twentieth century and the development of the sciences of biochemistry and genetics. John Gerard, The herball or Generall historie of plantes ( London : [Edm. Bollifant for [Bonham Norton and] Iohn Norton, 1597). John Gerard, The herball or Generall historie of plantes. Gathered by Iohn Gerarde of London Master in Chirurgerie very much enlarged and amended by Thomas Iohnson citizen and apothecarye of London (London: Printed by Adam Islip Ioice Norton and Richard Whitakers, 1633). Thomas Moffet, Theater of insects, in Edward Topsell, The history of four-footed beasts and serpents. . . ; whereunto is now added, The theater of insects, or, Lesser living creatures . . . by T. Muffet . . . (London: Printed by E. Cotes for G. Sawbridge … T. Williams … and T. Johnson …, 1658). Miruna Achim, “From rustics to savants: Indigenous material medica in eighteenth-century Mexico” Studies in History and Philosophy of Biological and Biomedical Sciences 42 (2011) 275-284. Amy Butler Greenfield, A Perfect Red: Empire, Espionage, and the Quest for the Color of Desire (New York: Harper Perennial, 2006). Henry M. Reeves, “Sahagún’s “Florentine Codex”, a little known Aztecan natural history of the Valley of Mexico” Archives of natural history 33.2 (2006) 302-321. Neil Safier, “Global Knowledge on the Move: Itineraries, Amerindian Narratives, and Deep Histories of Science” Isis 101.1 (2010) 133-145. Simon Varey (ed. ), The Mexican Treasury: The Writings of Dr. Francisco Hernández (Stanford: Stanford University Press, 2000). This entry was tagged cactus, cochineal, Francisco Hernández, Mexico, Nahuatl, Native American, natural history, nopal, opuntia. Bookmark the permalink.